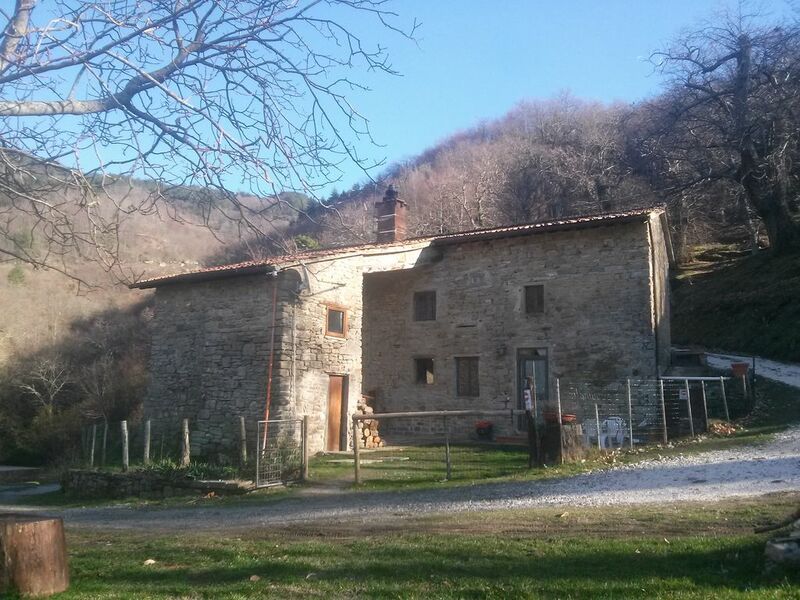 Typical stone farmhouse in the beautiful Florentine countryside of the Alto Mugello. A quiet, relaxing place in the Natural Park of the Casentino Forests Monte Falterona and Acquacheta Waterfalls. 1 bathroom with shower equipped with: shampoo, soap, paper, hairdryer and a set of 3 towels each guest. 2 comfortable bedrooms with linen included. Coffee, salt, sugar, spices and a small supply of Tuscan oil and local products km 0. Large living room with fireplace, Wi-Fi, HD TV, sofa and all the comforts. A large private garden to relax in front of a splendid view of the valley surrounded by ancient woods. Chairs, tables and garden beds, barbeque, and a large space for your animal friends. Perfect for lovers of nature, tranquility, good food and Florence. In addition to the many possible excursions in the national park, in the nearby village of San Godenzo you can visit the ancient Benedictine Abbey, find small shops, restaurants and public transport links. Many possibilities for hiking, trekking / hiking but also suitable for those who want to visit the surrounding villages, the typical Florentine countryside, the Chianti, the Casentino, the Alto Mugello, Florence or the Romagna Riviera. At the house you arrive by car along a short private road to the private parking included. with useful advice, information and trying to satisfy every possible need. In the house there are maps of the area and tourist info. Animals and children are always welcome. Situated in Mugello, this hotel is within 50 mi (50 km) of Autodromo del Mugello, Ponte Vecchio, and Cathedral of Santa Maria del Fiore, and close to Florence Stadium, Stadio Artemio Franchi, and Basilica di Santa Croce. I am friendly, hospitable, and always available when needed. Happy to help in any way my guests with helpful advice, information and trying to satisfy every possible need. Privacy, cleanliness, availability, relaxation and satisfaction of my guests are the most important things. The tranquility, the freedom and the privacy that offer the wild zones and the countryside. The beauty of the surrounding nature. Towels, shampoo, soap, toilet paper and hair dryer included. I had a wonderful time at this place with my family. The house is cosy and comfortable and Simone is a very welcoming, friendly and helpful host. The view is beautiful. This is truly a place where one can relax and forget for a while about the rest of the world. It has a unique atmosphere which makes you want to visit it again. It is located close to the National Park of Casentino Forests which means there are many great places for hiking nearby. The views are spectacular. I would heartily recommend it to anyone who loves nature and wishes for some quiet time away from it all. It was a pleasure having you as guest. Also you can take the scenic route SS67 famous throughout Europe, motorcycling. excellent restaurants. good wine and much more.